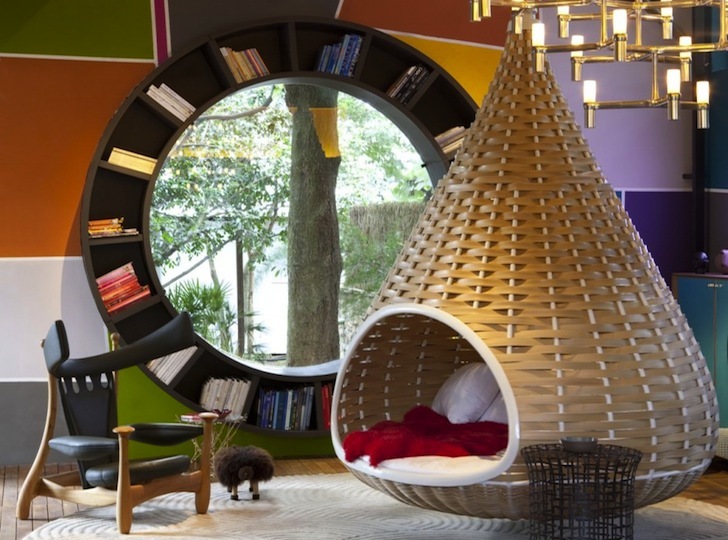 Fabio Galiezzo took a shabby shack in Brazil and transformed it into a colorful urban cabin decked out with nest beds and an awesome spherical shelf that frames views of the verdant surroundings. The original building was so dilapidated that Galeazzo propped it up with bamboo beams and columns and topped the whole place off with a series of green thermal tiles. Flip through our gallery for photos of this inspiring project. The Urban Cabin’s interior flooring is comprised of a combination of FSC-certified timber and brown granite. Since the structure sits amidst a shaded woody area, it was treated as a work of art – a la modernist painter Tarsila do Amaral. The bright colored stripes and irregular forms give the youthful home an attractive lift. The spherical window doubles as an awesome bookshelf that draws a distinct connection between the interior and exterior, while the lovely hanging nest beds round off the project’s overall sensitivity to and celebration of nature. Outside, nautical, stretchy fabric is used to shelter the owner’s tiny vehicle and the outdoor barbecue is decked out in beautiful tiles. Although this might be a bit bright for some, we absolutely love this home. That is ok if you wanna live on a concept store. 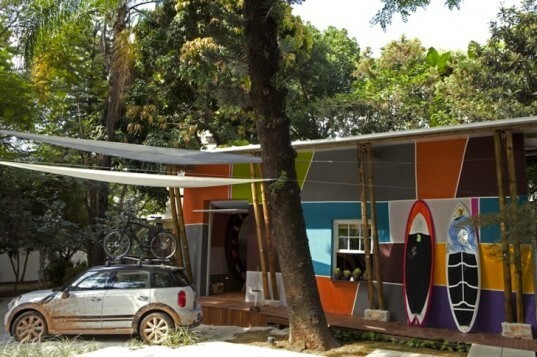 Fabio Galeazzo turned a shabby shack into a lively urban cabin in Brazil. The roof is capped with solar thermal tiles.